Hamsters are generally low-maintenance pets, but that does not mean they do not require daily care. Neglecting your hamster's living area can cause health problems for your pet and odor problems in your residence. Regular maintainance of your hamster's enclosure helps ensure that you and your pet can enjoy your time together in a healthy and pleasant enviroment. The American Society for the Prevention of Cruelty to Animals recommends performing basic cleaning duties on your hamster's cage every day. Basic cleaning entails removing old food, soiled bedding and feces from your hamster's environment. If necessary, you may add more bedding to the cage after you have removed the soiled shavings. The ASPCA recommends completely removing all the old shavings in your hamster's cage and replacing them with fresh shavings once a week. Take the time to scrub the enclosure using hot, soapy water during this weekly cleaning. Make sure the cage is completely dry before adding fresh shavings; otherwise you risk ruining the shavings with moisture. Wood shavings are a popular choice of bedding for hamsters. It is important to make sure to use only shavings that are intended for use with pets. Aspen shavings are the most common type of shavings for hamsters. Avoid using shavings made from pine or cedar; their chemicals and fumes can be detrimental to your hamster's health. 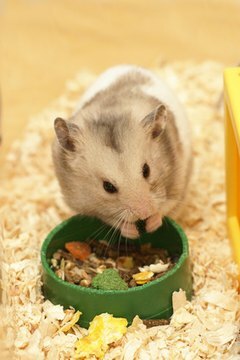 Some hamsters may attempt to eat certain bedding; if yours does, try another brand or type. Clean your hamster's cage any time you believe your animal has become sick or shows signs of illness. Signs of illness in a hamster may include diarrhea, runny nose, weakness, lethargy, sunken or dull eyes, or any type of visible wound. Cleaning the cage during times of illness and keeping the area clean can help prevent the spread of illness and bacteria.